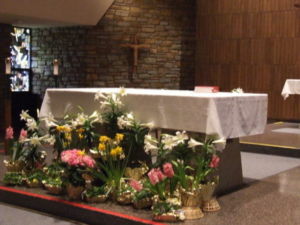 Next Saturday, the Easter Vigil, is always one of the most emotional days of the year for me. It’s not the waiting between Good Friday and Easter Sunday, it’s not the family time or the excitement of my kids for the Easter Bunny. It’s not the extra readings at Mass (as great as those are) or the passion of the Easter fire, the singing of the Exsultet and lighting of the new Paschal Candle. It’s watching the baptism, confirmation, and first communion of the elect. The adults who have chosen this year to become Catholic, to become new creations in Christ through the waters of baptism and who get to share with us for the first time and the banquet of the Lord. It’s the only day of the year that we get to witness adult baptisms as Catholics. And for that reason it is a night different from any other night. For years, in a previous role, I led those brave women and men through their preparation process, which often took years. But its not just the amount of work, or sheer courage of those people that brings me such emotion. It’s the amazing love of God poured out in the form of grace upon all of us on that night that marks the hinge upon which the whole year, and the whole earth, turns. For baptism isn’t just a symbol, its not a membership card, or an insurance card — though we often treat it as such. No, baptism is a very real drowning, a death, of our old selves and a rebirth in Christ. And that makes all the difference. Last week, in my reflections, I talked about how Pope Francis challenges us to start running. The response is often — “but, I’m not prepared.” But Jesus tells us over and over, year after year, you are ready, you are prepared — you are baptized! My prayers are with you this Holy Week — from Palm Sunday, through Holy Thursday, Good Friday, Holy Saturday, on through to Easter Sunday evening. May you celebrate all those who will be joining us as fellow Christians on the journey and may you remember your own baptism and the extravagant love God has for you.